What if I told you that you could have a vacation experience that offers exciting adrenaline rushes, peaceful relaxation, authentic ancient cultural experiences, world class gourmet cuisine, picturesque natural surroundings, and 5-star concierge service? Would you think it would be too expensive? Could it be possible that something like that could exist for the whole family? We happened to visit such a place and are excited to give you a glimpse of the splendor that awaits you at Hotel Xcaret in Mexico’s Riviera Maya. Hotel Xcaret Mexico is built with the focus being on natural and traditional Mayan and Mexican architecture and surroundings. This is very evident when you arrive as you stroll through the lobby and get you first glimpse of the natural river winding through the resort. The azure waters offer guests the opportunity to explore via kayak, stand-up paddleboard, or go for a refreshing swim in the spring fed river as it weaves its way through the grounds. The hotel itself consists of five different buildings for the different rooms, ten restaurants, right bars, and endless opportunities for fun. 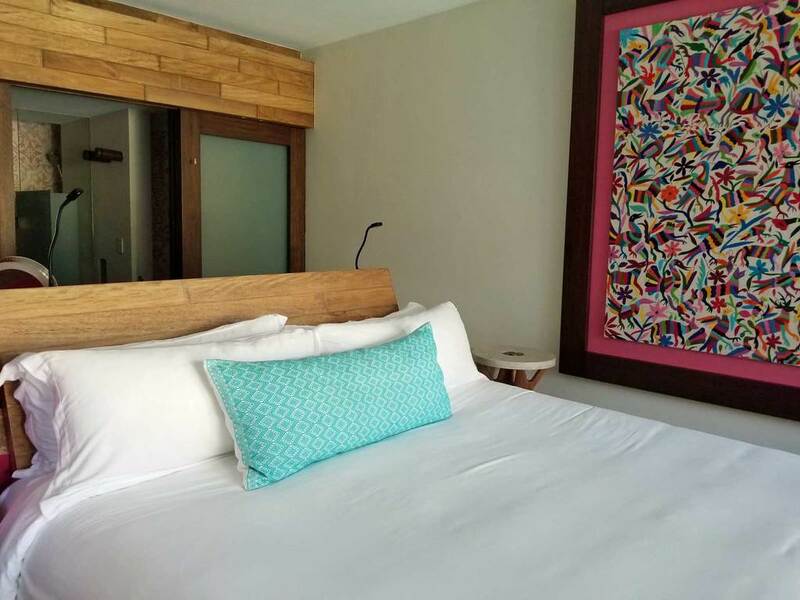 The all-suite Hotel Xcaret offers luxurious family-friendly and adults-only accommodations beginning with the Suite up to Presidential Suite. Five buildings play home to the suites: Casa Fuego, Casa Tierra, Casa Agua, Casa Espiral, and Casa Viento. Each building is named for a natural element of life: fire, earth, water, spirit, and wind. As you can see from the pictures below, the rooms are tastefully appointed with up-to-date technology such as USB charging stations by the bed, natural fibers, bright colors, and hand-made authentic tapestry wall-hangings. The floor plans and lay-out of majority of the suites are the exact same. The spa building, Casa Agua, features a large stone tub on the balcony in addition to being just steps from the spa entrance. The bathrooms allow you to capture the gorgeous view from your room while still offering privacy with a cool vanishing window. The view from the rooms? … well, that’s my favorite part. There are plentiful options for an amazing water view right from your balcony given the river, pools, and turquoise Caribbean Sea. If you’re looking to have an adults-only experience, then Casa Fuego is the place to be. It’s also a great option for couples that may be part of a wedding or anniversary, but want some more privacy and seclusion from families with children. 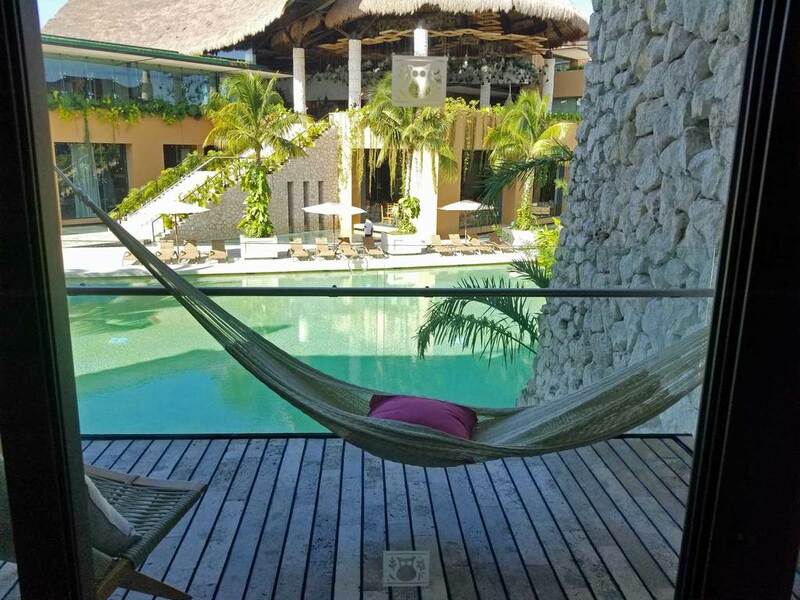 There are 70 rooms total in Casa Fuego with a dedicated restaurant, roof top bar, infinity pool with killer views, private check-in/out, and an upgraded room service menu. You truly could never leave the building. Great dining venues are available for all occasions, whether it’s a journey to the traditional Mexican fare at Cantina Los Faroles, a trip back in time to the 1950’s when dinner shows were all the rage at Teatro Del Rio (reservations required), or just a chance to sample a variety of flavors from all over the world at Chibali. The bars all serve top shelf liquor brands; drinks both alcoholic and non-alcoholic are included with your stay. Oh, and for every pool at the resort, there is a bar to go along with it. So, here’s the best part about Hotel Xcaret Mexico… you get free access to all of the Xcaret family parks and experiences as part of your stay. All of the top rated destinations in the Cancun and Riviera Maya (Xcaret, Xoximilco, Xavage, Xenses, Xel-Ha, Xplor, and Xplor Fuego) as well as tours to ancient Mayan culture centers like Chichen Itza, Tulum, or Coba, and experiences in the cenotes (underground spring fed rivers) are all included in your stay. The value proposition is very high if you compare what you’d spend for all this separately. But how do you get there from the hotel, you ask? Transportation is included as part of your stay as well. The resort also picks you up from the Cancun airport and takes you back when your stay is over (even though you might not want your stay to end). 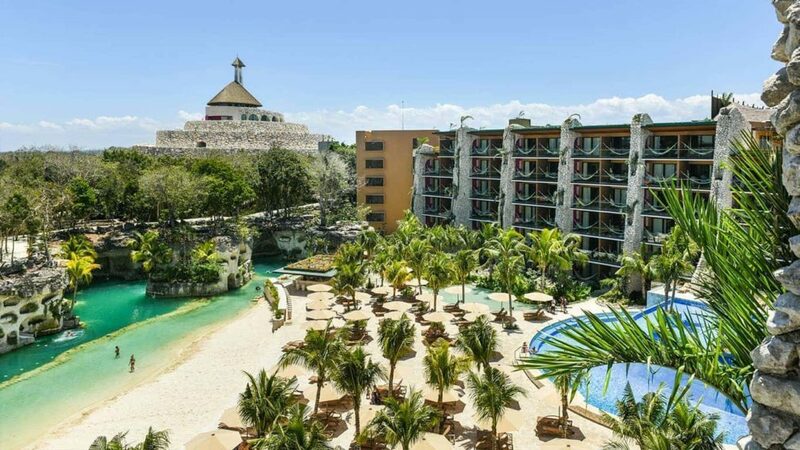 The beautiful property, included transportation, and included activities of this caliber all add up to make Hotel Xcaret one of our personal favorite resorts in the Cancun and Riviera Maya region. You are going to relax, recharge, and find a new level of peace at the Muluk Spa. Built amidst the river flowing through the resort and with the relaxing jungle as a natural backdrop, you’ll find yourself whisked away from your troubles and stress. The spa features all the services you know and love including a hydrotherapy experience which is available as a day pass. You can choose from their menu a series of journeys as listed below with services ranging from 25 to 90 minutes in length. 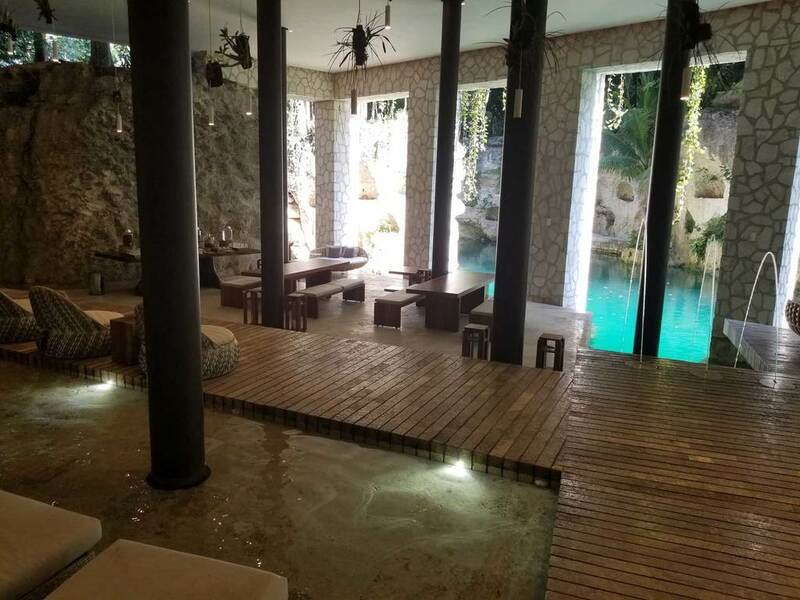 There are numerous different treatment cabins that are nestled into the limestone, but I’d recommend you request number 17 which features a private cenote (natural spring) inside. Inspired by ancient traditions and using regional products such as honey, cocoa, cinnamon and clay; this journey offers a wide range of treatments that have been adapted to modern warriors who wish to travel through time. Inspired in the age-old traditions of India, approaching health from a holistic, comprehensive and personalized point of view, this journey offers treatments such as Abhyanga (ayurvedic massage) a technique that aims to balance the brain hemispheres while stimulating "marma" (vital energy) points through synchronized movements. A personal and sensory journey through 2 baths and 2 flotariums which offer healing and cosmetic properties known since ancient times. State-of-the-art technology aimed at improving skin care through non- invasive processes. This journey offers facials and body treatments mainly used to nourish and renew the skin as well as to improve skin health. As you can see, there is a lot to love about Hotel Xcaret Mexico. 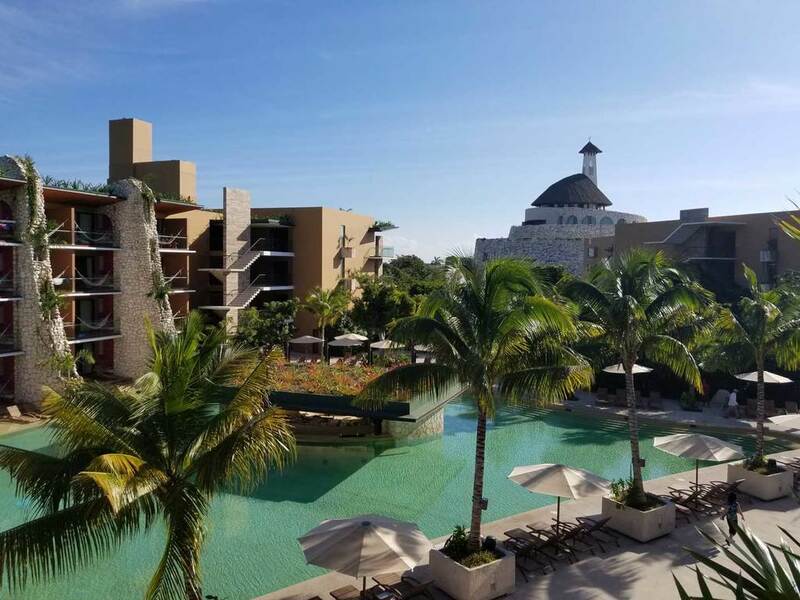 We would recommend this resort to families with children older than four, honeymooners (this resort is a perfect location for your destination wedding), active adults, and anyone interested in learning more about the beautiful culture of Mexico. [Children younger than four years of age would still benefit from the kids club, water playground, and included strollers though you’d know best if your child would be able to endure a day traipsing through parks.] You could easily spend ten to fourteen nights at the resort with all there is to do and see, but we would recommend you stay at least seven nights to give yourself the opportunity to experience the best of what Hotel Xcaret brings to you. To get started planning your trip to Hotel Xcaret or any other Mexican destination, contact us here. Have a comment or story you’d like to share about Xcaret parks or Hotel Xcaret? We’d love to hear from you. Each month we'll send you the latest reviews, insider tips, and fun facts about destinations across the globe. Find out how you can check those places you've always wanted to visit off your bucket list.